Live Creating Yourself. : Don't mind me... over here creating myself. I decided to take up a new hobby. Truth be told I was inspired by this instagram from Dallas Shaw. I saw it and thought, "I want to to do that." So last night I marched over to Blick Art Supplies in Lincoln Park (well, drove) and snatched up some pretty Prisma markers just like the one in Dallas' photo. Then I saw Blick sold similar markers for a fraction of the price, and well, considering this lil hobby could go horribly awry (ie I lack any skill) or I could tire of it in a week (typical), I figured I'd start with the $1.88 markers instead of the $3.50 markers. 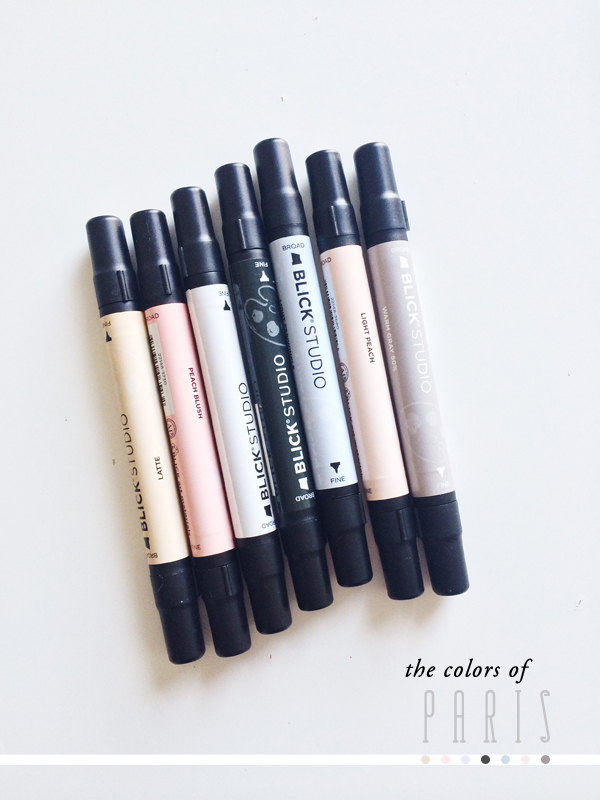 Now, I don't know if you've ever been in a bonafide art supply store, but they make these markers in every color under the sun. "Putty,""Latte," and "Stone" are all different. Fact. And I bought all of them. I could've gone primary colors - cover my bases. But I thought about what I'd try and draw... and one thing stood out in my mind. So I went with the colors of my favorite city. My mom always said "Paris has its own light. "Anyone who's ever been can attest that is true. The color of that city is indescribable. Like you're looking through rose-colored glasses. Everything is softer, hazier, prettier... I figured if I lack any and all skill, at least the colors on the page will be lovely. So last night, after a late-night meeting with some of the Everygirl editors, I stayed plopped on my sofa, pulled up a photo Danielle took in Paris, and started... drawing? Making it up as I went? Trying to recreate a snapshot of my favorite place. It turned out ok! I quickly learned I cannot draw straight lines... so instead I just kinda scribble back and forth until a line takes shape. Next, I recreated my living room. Unfortunately, the "Latte" color turned out a lot more pink than beige so the coloring is a bit off... I need to head back to the art store and pick up a proper beige and a lovely gold pen! I think it's really what the living room sketch is missing. So yea! So far so good. It was so fun, and soothing, and nice to create something NOT on a screen. Do any of you draw? Or paint? Or picking up a new hobby just for kicks? I highly recommend it! I used to draw all of the time. I haven't for the longest time though; I don't know if I'd still be any good! But I kinda want to try again. It was always nice and relaxing. It looks like you're definitely off to a good start! it looks great! especially the paris picture! i have been thinking about trying drawing or watercolor lately. i think i might have to try soon! I love little sketches like these! They make the best home made art when you frame them. And I agree, you need a little gold in that living room- maybe in Paris, too! i love that you did this despite how busy you are - such a good reminder to make time to have fun and learn something new. and they really look beautiful! I just bought myself a calligraphy pen to try that! Partially because of my upcoming wedding, but also because it's something that I'd love to know how to do. I love this! I'm inspired to do the same! I also am dying to try calligraphy! wow girl, you have talent!! we knew that of course but seeing it again always makes me smile!!! 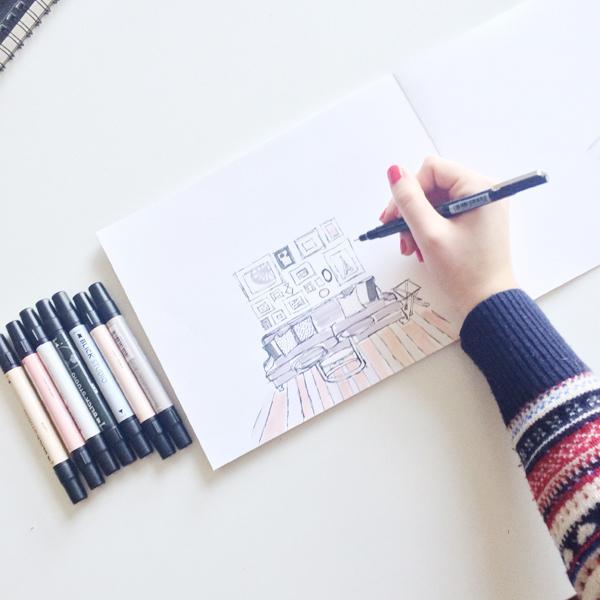 I am seeing so many bloggers embrace their inner artists this year, so wonderful to see you joining in! These little drawings are lovely and you have a great eye for perspective! Thank you so much for sharing - I used to love to draw and I havn't picked up a pen and paper in forever! This just inspired me to try to get back to it. 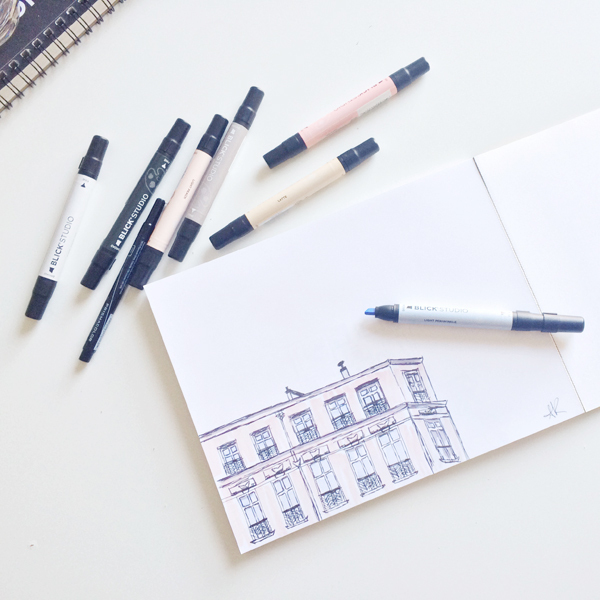 Your illustrations look great - I love the idea of using the colors of paris! Those look great! Nice job! I absolutely love this idea! I've been thinking of calligraphy and this might be just the occasion! These are wonderful! Thanks for sharing your drawings with us. It's true Paris has it's own light! I think you captured the city rather nicely. Hopefully you'll share more drawings with us in the future. So pretty!!! I minored in art in college, but specifically photography...I had to take some drawing courses, which I was terrible at, but I learned to see things in terms of "negative space" to help imagine the drawing; another trick I learned was to NOT look at the paper while drawing a line (this sounds counter-intuitive, I know) but to slowly move your eyes across the line you're drawing as your hand moves across the paper, and when your eyes reach the end, you should reach the "end" in your drawing. Sounds crazy, but it actually works and helps with dimensions and perception vs reality! Looks amazing!! I learned how to do that while getting my bachelor's in interior design. So fun, but took so much patience! Watched by a couple of his masters who are replica handbags indeed missing him, the fight between Natsu and Kenichi is really very good. Natsu doesn't like that he's being used in this kidnapping event but he has such replica wathces a grudge against Kenichi that he'll fight him any way possible. The fight itself is really good with interesting combinations and the animation for it is more detailed and fluid than most of the series in general which heightens the intensity of the fight. And with a fight like this, we get a lot of history on Natsu which has some gaping plot holes but adds a lot to his prada handbags overall motivation and his method of fighting alone with no real ties. There's an interesting moment when he again forcefully puts himself on the path of being alone yet has Miu's grandfather warning him that the path is empty and that he knows it because he's walked it himself.